A doctorate in public health online program helps you gain the specialization necessary to earn a research position within the medical field or to gain employment in the highest levels of the sector as a research director or an administrative manager. As a specialist in public health, you can expect to gain the knowledge you need to help organizations implement optimal administrative practices, including the coordination and design of systems to improve patient-doctor relationships, to facilitate benefits for medical personnel, and to train new and seasoned professionals in the latest in medical service organization standards. The skills learned in a doctoral program in public health are extremely valuable to modern health organizations of all types and levels of complexity. According to the Bureau of Labor Statistics (BLS), a medical and health services manager earned a median annual salary of $96,540 in 2017, a number the BLS projects to grow by 17% over the next seven years. Institutions design their doctor of public health online programs to equip graduates with the highest level of expertise in the field. Most programs take a multidisciplinary approach, offering courses in management, communications, and leadership alongside courses with a more medical focus. Collaborative learning environments help students develop the nuanced thinking they need to successfully address the complexities of public health policy and lead organizational change. Programs typically feature faculty with significant background in the field, ensuring a hands-on manner of instruction. Top online public health doctoral programs expect applicants to already possess a bachelor's or master's degree in health sciences or a related field, such as business, health care, psychology, economics, medicine, or biology. In addition, schools expect applicants to have gained between two and fours years of experience as a full-time public health employee. The best-prepared candidates for the top public health doctoral programs typically possess experience in a wide selection of public and private areas of health care. The “right” doctor of public health program is different for every individual. Depending on what areas you already have a background in and what specializations you have a desire to carry forward in your career, the doctoral programs in public health that you consider should reflect your specific interests. Most higher learning institutions can answer any questions you may have about leveraging your experience to pursue a doctoral program, so talking to the consultation staff at your alma mater first is always an excellent idea. CAN I WORK WHILE I COMPLETE MY ONLINE DOCTORATE IN PUBLIC HEALTH? Doctoral programs in public health are usually tailored to fit the needs of mid-career medical health professionals seeking to broaden their knowledge base and training in order to effect organizational change as an administrative or medical professional. The broad community of peers that online learning fosters allows for a high degree of collaborative learning. Students in doctoral programs have already gained experience working in the field, and online programs are designed to be flexible enough that students can continue to work while they pursue their degree. LLU offers a DrPH in health education program that develops health education specialists’ expertise in research, management, and leadership in health education programming. This 95-unit doctor of public health online emphasizes healthy lifestyles and community health education. Students engage in critical analysis of health behavior change, advocacy, and communication. This program can be completed in seven years of full-time study and requires one on-campus visit to LLU to conduct research. Online courses are delivered asynchronously, allowing students to complete coursework at their own pace. Graduates from public health doctoral programs commonly pursue careers as university-level educators and managers in the evaluation and management of public health education programs. Applicants must have a master's degree in public health or a related field with a minimum GPA of 3.2 and submit competitive GRE scores to be considered. Students should also have post-master's professional experience. LLU is accredited by the Western Association of Schools and Colleges. UIC offers a DrPH in leadership through the School of Public Health that is designed for mid-career public health specialists. 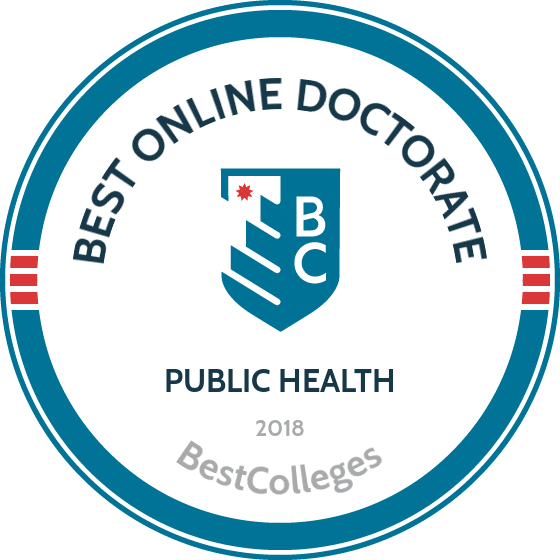 The 96-credit doctor of public health online is a part-time program that includes study of public health leadership, policy development, epidemiology, and special topics to accommodate students’ areas of interest. The program is delivered online through Blackboard with some required visits to the Summer Institute. Students can transfer up to 35 credits from their master's in public health into the doctor of public health program. Most students enroll in six to eight credits per semester and complete the program in four to six years. Applicants must have a master's degree in public health or a related field and a minimum of three years in a leadership position to be considered. Although the GRE is not required, applicants are encouraged to submit scores as part of the application process. UIC is accredited by the Higher Learning Commission. UNC offers a HPM executive doctoral program in health leadership that emphasizes the practice of healthful lifestyle behaviors and community health education. The 45-credit program is ideal for those who work full-time and have substantial leadership responsibilities at organizations, governmental agencies, and within communities. Coursework covers a variety of topics, including health policy research, epidemiology, methodology in health policy and management, and linear regression models. Students must also complete comprehensive written and oral exams as well as a dissertation throughout the program. Students can complete the doctor of public health online in three years of full-time study. During the course of their studies, students are required to attend three- or four-day campus visits in the fall, spring, and summer terms. Applicants must have a master's or doctorate degree, previously completed graduate-level coursework in public health, behavioral sciences, epidemiology, and environmental health, and submit current GRE scores to be considered. Educational institutions design their doctorate of public health programs around the needs of experienced health professionals who have already obtained a master's in public health or a similar program. These programs generally involve a number of potential specializations. Students can expect to self-direct their research and participate in a hands-on curriculum. Some doctor of public health programs may have more of a focus in research areas, while others may have more of a focus in management practices. In order to get a better idea of what courses an online doctorate in public health may feature, consult the list below. Topics in Health and Wellness: This course typically covers the role of a physical therapist in health and wellness for both communities and individuals. The course explores public policy, community accessibility, and health behavior, along with the role of intervention, assessment strategies, and outcome evaluation. Enrolled students choose a concentration topic, such as integrative care, preventative care, or adaptive technologies. Advanced Clinical Practice: In this course, students integrate skills they have learned in clinical foundation courses with the advanced theory of medical protocol through case studies and fellowships to prepare medical professionals involved with clinical work. Students pick a topic of interest based on their clinical practice history and research according to their instructor's curriculum framework. Healthcare Systems Organization, Delivery and Economics: A focus on healthcare systems organization, delivery, and economics allows students to discuss the structural and economic foundations of the medical system, including health care delivery, the financing of health technology, and the structure of health organizations. The course explores health policy and various methods of health care delivery within a seminar context in order to facilitate a student's understanding of contemporary issues in the implementation of health care as an administrator. A PhD program is typically among the most time-intensive academic tracks in the public health field, and can take learners as long as five or six years to complete, depending on the amount of professional experience an applicant has or the level of specialization of the public health doctorate a student pursues. In addition, the pace at which a learner progresses along their degree path may vary according to whether they are full or part-time students. Public health doctor degrees take less time than most other doctoral programs, with full-time students completing all requirements within two to four years on average. Some online doctoral programs in public health may structure their degree path according to a cohort model, which requires applicants to enter the program together as a group in order to properly facilitate online discussions, testing, and forum usage. In general, a public health PhD requires that students complete about 60 credits of coursework, as well as a dissertation on a public health topic related to their specialization, but requirements may vary from school to school. Successfully passing the accreditation process is important for schools. Accreditation maintains a high standard of education in a given institution of higher learning by providing a basis for differentiation between accredited schools and those that have not met a minimum standard. Regional accreditation is a process undertaken by a college or school to conform to that standard through inspection and evaluation by a third party organization. National accreditation is a separate but necessary requirement of any college attended with received federal grants or aid. There is no specific accreditation required in addition to regional or national accreditation regarding the best online doctoral program in public health, but some programs work directly with employers and may offer exclusive fellowship opportunities. In addition, public health programs have their own accreditation bodies, such as the CEPH (Council on Education for Public Health) and the AAPHP (Association of Accredited Public Health Programs). The United States Department of Education (ED) is a federal agency established in 1979 to regulate policies concerning all schools and colleges within the United States, to coordinate federal assistance for education, to gather data about schools, and to enforce federal laws regarding education. The ED works to promote the success of education within the United States and has no direct hand in the accreditation process itself. The Council of Regional Accrediting Commissions (CHEA) and similar bodies work to maintain educational standards and keep universities in the United States competitive, and with institutions of higher learning around the world. Interested applicants may look for one of the seven organizations that make up the CHEA. The ED makes a list of universities with national accreditation available to the public. Although a master's degree can help prepare you for top administrative and teaching positions, a doctorate from an accredited online doctoral program in public health conveys an additional level of certification. The Bureau of Labor Statistics projects that individuals employed in top positions in public health services, such as in management and administration, stand to see a salary increase of 17% from a median annual income of $96,540 in the next seven years. An advanced degree in public health policy can help give candidates for these positions a leg up in terms of job placement and have led to increasing enrollment in these programs in recent years. In addition to natural variation between workplaces, the level of professional experience of a graduate or PhD-holder impacts the annual earnings of a position within the public health industry. The following table features data from the Bureau of Labor Statistics regarding states with the highest-paying salaries for the position of health and medical services managers. The career paths that an online doctorate in public health prepares for include the highest levels of public health administration and management. Detail-oriented individuals might find satisfaction in a research position at a medical school or as a professor of public health theory and practice. More generalist-oriented individuals might find themselves gravitating towards an administrative position within a hospital or a similar medical organization. Whatever your inclination, earning your online doctor of public health provides you with the highest education levels of expertise and preparation. A health and safety engineer helps to design systems and develop procedures that prevent people from getting injured or sick and prevent damage to property. They combine a thorough knowledge of engineering and safety standards to ensure that medical technology, chemicals, and pharmaceuticals will not cause undo harm. An environmental scientist or environmental health specialist uses their background in the natural sciences to help protect the integrity of a given ecosystem and the health of humans in the environment. They work to clean up pollution, provide advice to policymakers, and work within medical industries to reduce waste. Sometimes working under the titles of healthcare administrators or healthcare executives, medical and health services managers coordinate, plan, and direct the logistics of medical and health organizations. They could be tasked with managing a hospital, a specific area or department of a clinic, or a group of physicians. Medical and health services managers work to ensure that establishments conform to regulations in healthcare laws and technological standards. Statisticians use health data and advanced statistical methods to gather and analyze problems facing the medical industry. Public health issues are often put in perspective with other areas of economic activity through these statistical methods. An epidemiologist is a public health professional who investigates the causes of injury and disease in humans and works to find patterns in their presentation. They work to reduce the prevalence of negative health outcomes through the creation of new policies, practices, and educational standards. Leading organizations in the field of public health policy know how to help emerging professionals and recent doctoral graduates gain access to networking opportunities, attend conferences, and obtain career services. These organizations, such as the American Public Health Association and the United States Public Health Service, offer continued learning opportunities and training in the field of public health policy. The Council on Education for Public Health is a private, non-profit corporation which establishes criteria for evaluating public health programs. The corporation works to ensure a high standard of education for public health students and facilitate their continued employment by promoting the best possible public health practices. The APHA promotes the health of all citizens and all different communities. The group is involved with directing the concerns of health professions to affect health policy on a federal level. The United States Public Health Service promotes public health services, disease prevention, and public health awareness through responding to public health issues as well as promoting leadership and high standards in public health services. Students should do research on FAFSA loans in order to understand funding opportunities like scholarships, grants, loans and work-study. Many low-interest rate funds exist with banks and lending partners in education. Certain bodies also exist to further the scholarship, grant, and fellowship opportunities for online doctoral programs in public health, such as the Center for Disease Control's Public Health Fellowships program. Because of the way doctoral programs in public health are tied to established degree tracks in master's programs and through medical organizations, many such bodies may also create employment funding opportunities for qualified professionals.